The Landing is a Celebrate Recovery youth group for teens! We realize that today’s youth struggling with issues such as addiction, divorce, peer pressure, depression, abuse and so much more! The Landing is for students that have hurts they can’t deal with, hang-ups that have them spinning out of control, or who aren’t really sure what’s going on, but they know something is wrong. It is a SAFE place for teens to express themselves and learn the necessary tools to find freedom and victory over their hurts, hang-ups, and habits. The Landing is a 52-week journey based on the 8 principles found in Matthew. By working through the Christ-centered principles among a community of peers and loving Christian adults, students gain access to tools which enable them to give their struggles to Jesus and find true healing and victory, as well as the tools for making wise life choices and developing healthy patterns for living. It’s experience based. Instead of students learning in a lecture format, they get involved with the lessons. They’ll write, draw, talk, move, answer questions and much more. It’s 52 weeks and it never stops. Just like Celebrate Recovery, The Landing goes all year long. Our hurts, habits and hang-ups don’t take a break so neither do we! The lessons are based on the Celebrate Recovery lessons. Students will experience lessons like, Denial, Forgiveness, Spiritual Inventory, and all of the 25 Celebrate Recovery lessons in ways that apply directly to them. It has 22 high quality videos from our partners The Skit Guys and Igniter Media. Students will write out their inventories and their testimonies. Help students overcome their hurts, habits & hang-ups in order to fully Love Jesus, Serve Others & Tell the World about Christ. Questions about The Landing? Click here to submit your question. All questions and information is kept confidential and will go directly to the Landing leaders Bob and Kenna Reese. Celebrate Recovery is a Christ-centered program that helps us deal with life’s “hurts, habits and hang-ups.” Our purpose is to celebrate God’s healing power in our lives through the 8 recovery principles found in the Beatitudes and the Christ-centered 12 steps as we become willing to accept God’s grace in solving our life problems. 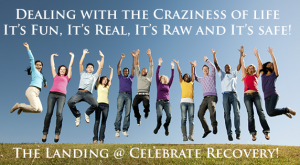 Celebrate Recovery is for anyone who has a hurt, habit or hang-up. It is not restricted to people struggling with an addiction. We all have issues that may be interfering with our fellowship with God and others. Therefore, we all qualify! Join us as we pursue real life change in Jesus Christ and celebrate the recovery only He can bring through His people and His Word.